Serato’s latest production tool, Serato Studio, is now in beta. 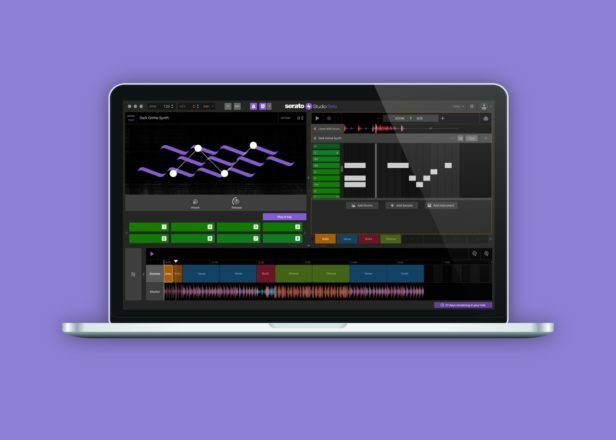 Digital DJ company Serato has added another tool to its music production portfolio, an accessible DAW aimed at DJs called Serato Studio. The DAW, which is currently in public beta, will be available via subscription. According to Serato’s Chief Strategy Officer, Nick Maclaren, the beatmaking software has been designed to be as intuitive as possible for DJs by incorporating design and workflow elements from its Serato DJ software. “Over the years we’ve spoken to countless DJs and beginners who want to start making music but either don’t have the time, the hardware, or feel overwhelmed with attempting to learn production software,” says Maclaren in a press release. Serato Studio’s “DJ-style workflow” includes the kind of features you’d expect from a DAW such as VST and AU support, automation and stem export alongside DJ-focused features like cue points, time-stretching and key detection. Serato is aiming to make it as accessible as possible with features like pre-made drum patterns, free monthly sound packs and one-click key shifting. Another feature that should make Serato Studio more appealing to Serato DJ users is support for Serato DJ hardware. With the barrier for entry to music production often being cost, not having to buy another controller may make Serato Studio more enticing than Ableton Live or Maschine. The subscription-based pricing strategy may also sway those who don’t want to spend a lot of money on a DAW. Serato Studio isn’t the first production tool from the DJ company. Previously, it released a sampler plugin and a time-stretching tool called Pitch ‘n Time, which also features in Serato Studio. No release date has been announced for Serato Studio yet. Update, March 29: Serato has “paused” beta signups due to an influx of users. Serato does plan to reopen the beta in the future, and anyone interested can register for updates on the next opening here.